The resume is about 500 years old. It was invented by Leonardo DaVinci. No knocks to DaVinci — great guy — but the resume is just not working for most Americans these days. Many employers rely on the credentials on a resume, like a bachelor’s degree, as a proxy for skill. However, this practice significantly narrows the pool of talent that a given employer might consider, and leaves millions of jobs sitting open. At the same time, tens of millions of workers are being overlooked for great entry-level professional jobs because they lack the right credential, even though they’re otherwise completely qualified. The massive systemic imbalance in hiring is what drives us everyday at Skillist. Our skills-based application process assures a fairer and more effective hiring process for everyone involved. We work with companies who have unfilled, entry-level roles like customer service or sales, and we help them to connect to great candidates who they might otherwise overlook. Wondering how it works? We work with employers to translate their job descriptions into a clear list of skills. 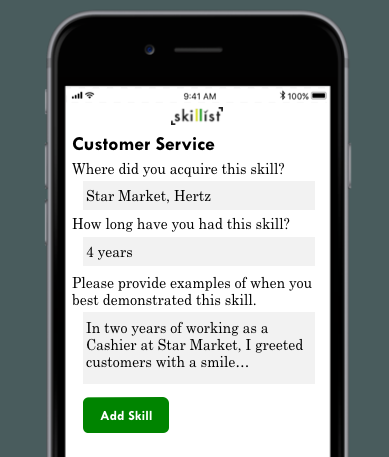 Candidates apply by sharing detailed examples of how they have developed and acquired each skill. We encourage users to draw from all aspects of their life, adding personal achievements and volunteering to more traditional professional activities like education and work history. When employers receive an application, there is no name or identifying information attached, which lets them make a decision based on skills above all else. Not only does this enable companies to make fairer hiring decisions, but it helps them access talent that they’re really excited about. During our pilot, we found that 40% of all Skillist applicants were passed through to the next round, meaning it was twenty times more effective than the pass-through rate on the average online job board. We are now thrilled to launch our commercial platform, and to be working with fantastic, forward-thinking employers like Wayfair and Harvard Business School. We also couldn’t do what we do without the support of exceptional community partners like YearUp, Duet, and Mass Bay Community College. This past month, we closed a pre-seed round of $550,000, led by Flybridge Capital Partners (Jesse Middleton) with additional participation from The Graduate Syndicate, Deborah Quazzo (co-founder, ASU+GSV), Jeremy Hitchcock (founder, Dyn), Shikhar Ghosh, Guli Arshad, and John J-H Kim, and additional funding from the Robin Hood Foundation. If you’re a company interested in creating in a wider and more inclusive talent pipeline, you can learn more here. Our team is also hiring, so if you’re excited about we’re building (or know someone who might be), we’d love to connect.